GOD BLESS PARIS.. RESTORE, HEAL AND COMFORT THE PEOPLE OF THIS BEAUTIFUL CITY.. This morning I want us all to take a moment and pray for God to bless comfort and restore peace to the beautiful city of Paris.. I have been very blessed to have visited this city several times.. My heart hurts for these lovely people. Many many people are dealing with the tragic news of the death of their loved ones today. It's such a reminder of 911.. People going about their normal life.. Then so needlessly and suddenly.. So many innocent families are permanently changed forever. No matter what, we shall not fear, FEAR NOT, the Bible says this 365 times.. That is one for every day! We must understand and know the authority we have in Christ and seek Him daily for protection, safety, wisdom and strength . We as Christians are a vast number.. The Bible says where 2 or more are gathered in agreement that mountains can become level plains. I am asking for each one of us to pray just a few minutes each day for Gods protection for this nation and for the world. These prayers can move mountains and restore peace. GOD IS THE ALL POWERFUL EVER LIVING GOD.. HE CREATED THIS UNIVERSE AND LET US INHABIT IT. WE MUST PRAY THAT THE BLOOD COVERING OF JESUS CHRIST COVERS OUR NATION TODAY... The enemy cannot cross the bloodline of JESUS! 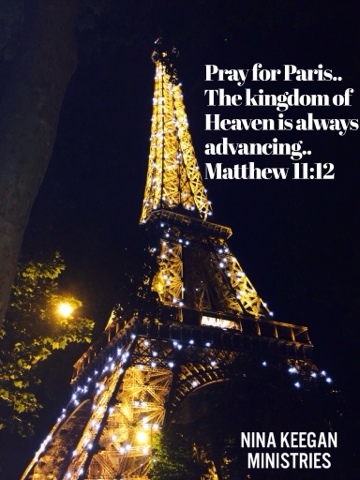 WE MUST ASK GOD TO ADVANCE HIS KINGDOM ON THIS EARTH TODAY.. WE MUST ALLOW GOD BACK INTO ALL THINGS... our government, schools, workplaces and homes! IN GOD WE TRUST.. Is on every penny we have!! Lord have mercy on us as a nation ,as a world! FORGIVE us our sins Lord as we turn our lives back to you in complete surrender. We ask Lord that your hand of protection would be on us. we thank you for your Psalm 91 protection to be over us, our land,our government, our leadership, our schools our homes, and families. We earnestly invite you back Lord! We seek you like never before to advance your kingdom and to protect us and lead us to a victory in you over evil. We overcome evil with good and we thank you Lord that your goodness and your light would be evident in all of us as we spread the gospel and the overcoming word of Jesus Christ! GOD BLESS PARIS.. And GOD BLESS THE USA! We love you and praise you Father! In Jesus holy name we pray!